The cheat sheet is here by the way. In case you want to know what your life could have been like, had your plans not failed. 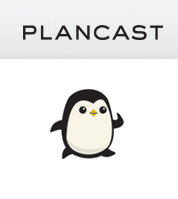 Here’s Plan Cast, helping you visualise the ambition vs. reality gap. And keeps a relentless record. 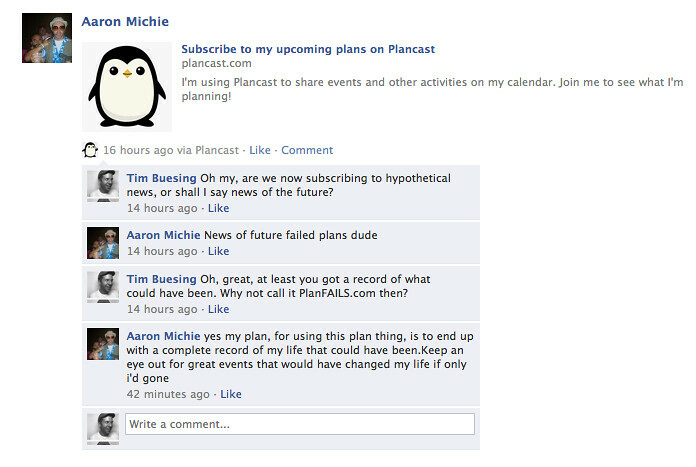 The service allows you to build up a calendar of things you then don’t get around to. And, you guessed it, your friends can subscribe to these ‘news’. The Melbourne Cup is being held for the 150th time this year and is often described as “the race that stops the nation”. In 2010 it seems to live up to its moniker with torrential rain flooding Victoria’s capital. But it also signals the beginning of spring, and for us at Holler it meant a fresh idea for how to best transfer a horse race onto facebook. 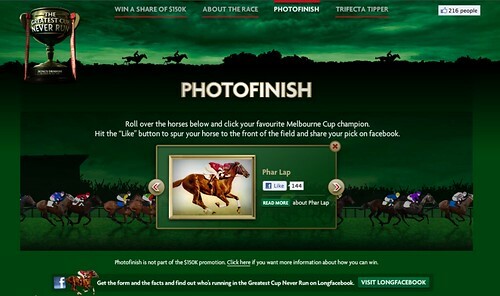 Check out Boag’s Draught’s “Greatest Cup Never Run” and click on Photofinish. Here you can Like any of the 24 best horses of all time. Besides engaging with other horse experts on the walls of Longfacebook, you will see how their race for some facebook love pans out. Currently the top two, legendary horses Makybe Diva and Phar Lap, are separated by nothing more than a single Like. This SOAP presentation is currently going gangbusters on Slideshare and deservedly so. All points are valid and true, my favourites are 2, 4 and 9. Actually, I regret not having written something like this earlier, as our hands-on experiences are very similar to theirs. Oh, and on the same day Amnesia have posted a story from their P&O cruise ship facebook page. It is unusual to see such a steady stream of posts, continuous threads of comments and obvious community feel to a group of facebook fans. Reminds me to share. more. knowledge. I’ll tell you a secret: I was getting a bit bored by the Digital Choice columns. Bored by descriptions of uploads, downloads, widgets, gadgets, tweets and posts followed by a screenshot. The latter usually small in size and framed by a browser, making the work appear complicated and even a minimalistic layout look cluttered. I don’t mean to attack any individual of the previous authors, more the format. 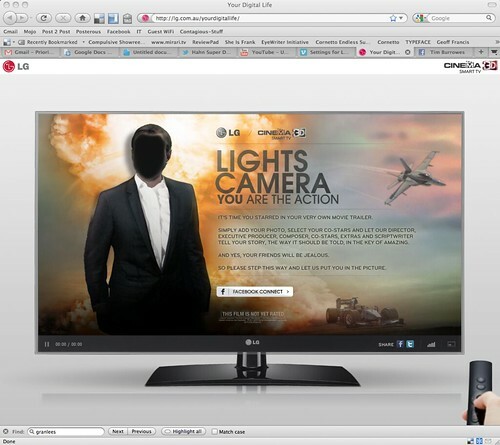 Hasn’t digital matured enough to now debate the idea rather than the execution? So this column features a campaign that is explained in five words: MyNRL makes rugby fans proud. 100,000 Australians became part of it in the space of 48 hours, 200,000 after 2 weeks with a total reach going into the millions – all boosted by a lavish media spend of zero. 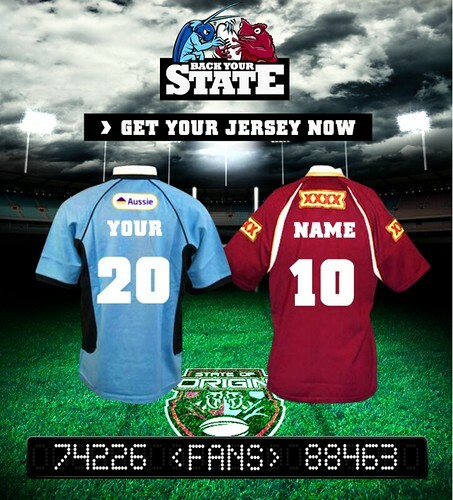 At the core of MyNRL lies a small facebook application that lets you do only one thing: create a personal jersey in order to back your state at the Origin games. Unite with your friends and tease your enemies. 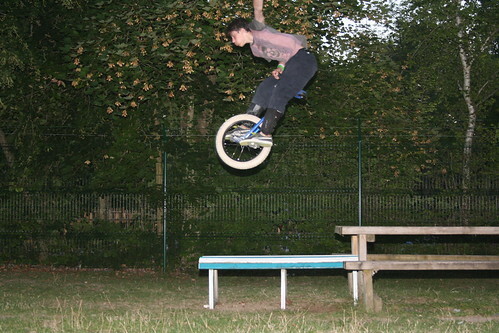 Simple as that, no fancy footwork, the thing is not even in 3D. 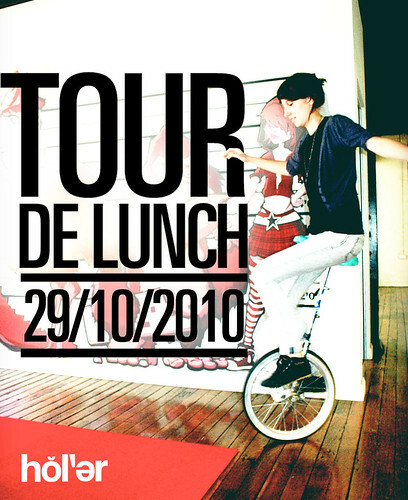 As the makers put it: “Timing was everything”. 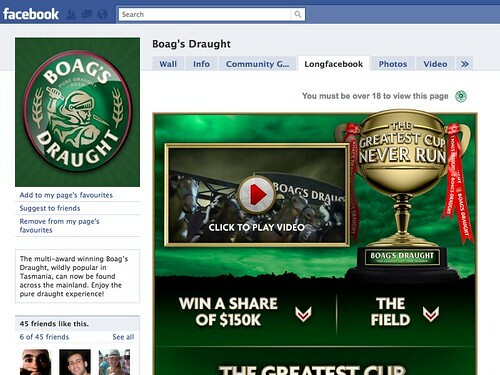 They seeded to the 16 NRL teams two days before kick off, with a single post on each of their Facebook walls. Its live game commentary made facebook punters part of the event, jump up from their sofas, sledge the opponents and show their pride. This is all far from cutting edge stuff but it still racked up a huge score. Several details made it so compelling and (dare I say it) “viral” that the idea spread like wildfire. And it continues to do so even though the Maroons have resoundingly won offline as well as online. You might have noticed agencies hiring content and community managers – this is one field those guys would love to play on. Before you think I am only talking about saving media dollars – I want to celebrate a beginning rather than a final result, the promise of something good to come. MyNRL has only begun because it has created a huge community in a couple of weeks. And sponsors must be tripping over themselves to join the scrum. Additional comment: I see plenty of opportunities to work with this community on facebook – congrats to Aden Hepburn from IdeaWorks for a project that took off like Lockyer’s 50-yard field goal in yesterday’s Maroons’ whitewash of the Blues.